Last week Maria and I were in Athens where we were participating in The Eco-Logic of the New Economy, a new event created by New Wrinkle, and which was inspired by our book Holonomics. The event was made possible by the support of Apivita, a Greek cosmetics company which was founded in 1979 with a philosophy and mission which was ahead of its time in terms of purpose, values, social responsible outlook and focus on innovation, including their customer experience. The day before Eco-Logic we were invited to visit Apivita’s factory and headquarters which lie just outside of Athens. We also had the chance to visit the Apivita Experience Store with Eugenia Bozou, Apivita’s corporate affairs manager, giving us the chance to learn much more about Apivita’s history and philosophy. The company was founded in 1979 by Nikos and Niki Koutsiana. Nikos’ parents were both beekeepers, and in the early 1970s as two young pharmacists they had started to create their own natural cosmetics using beekeeping products and herb extracts. Their inspirations came both from nature, both the honeybee society and the unique biodiversity of Greek nature, as well as holistic philosophy of health and well-being of Hippocrates. Apivita’s name is derived from the Latin words APIS (Bee) and VITA (Life), and means “life of the bee”. Their logo is inspired by the “Bees of Malia”, a rare Minoan piece of jewellery from the Middle Bronze Age (c. 1,700 BC) representing fertility and harmony. 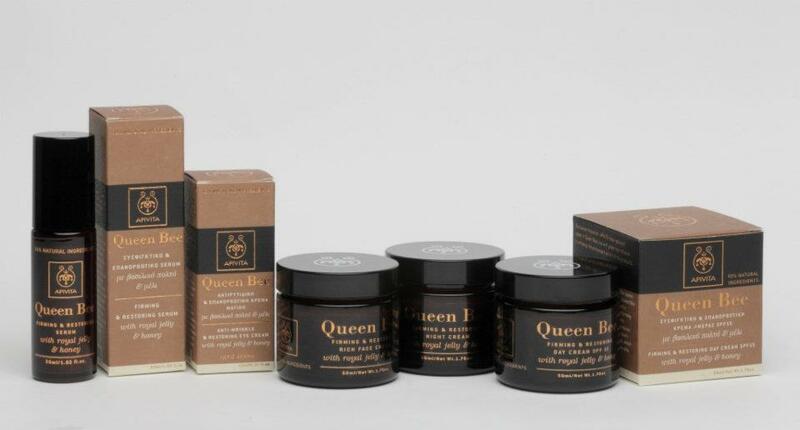 We create and develop beauty products and services which promote a balanced and harmonious way of life, based on Greek nature and its rich biodiversity and on the unique honeybee society and its high biological value products. We adopt the holistic Hippocratic approach to beauty, well-being and health, which, coupled with scientific knowledge, supports and enhances nature’s effectiveness. We promote “kállos”, the classical Greek ideal of inner and outer beauty, high aesthetic value, balance, moderation and well-being. This has now resulted in a wide range of cosmetics and personal care products which combine naturally derived active ingredients, extracts from plants of the Greek nature, beehive products of high nutritional value, and organic essential oils. The formulations of these products include natural ingredients ranging from 85-100%, excluding the use of silicons, mineral oil, propylene glycol, polycyclic musks, nitromusks, phthalates, as well as other ingredients that have been associated with adverse health or environmental effects. The approach across the whole product range is holistic in that each Apivita product provides multiple benefits such as hydration, protection from environmental aggressors, prevention and treatment of signs of aging or other problems. The idea is that all products can reinforce each other and act synergistically to offer maximum results. Having grown steadily in the first few years, Nikos and Niki decided to focus on Apivita full time, having also been working in pharmacy. While Greece has experienced severe economic challenges in the last few years, Apivita has continued to expand not only in Greece itself, but internationally, and now is present in 14 countries worldwide. One of the most interesting stories Eugenia told me was the development of the Apivita Experience Store, which opened at the height of the crisis and with many people wondering how this venture could possibly make sense. 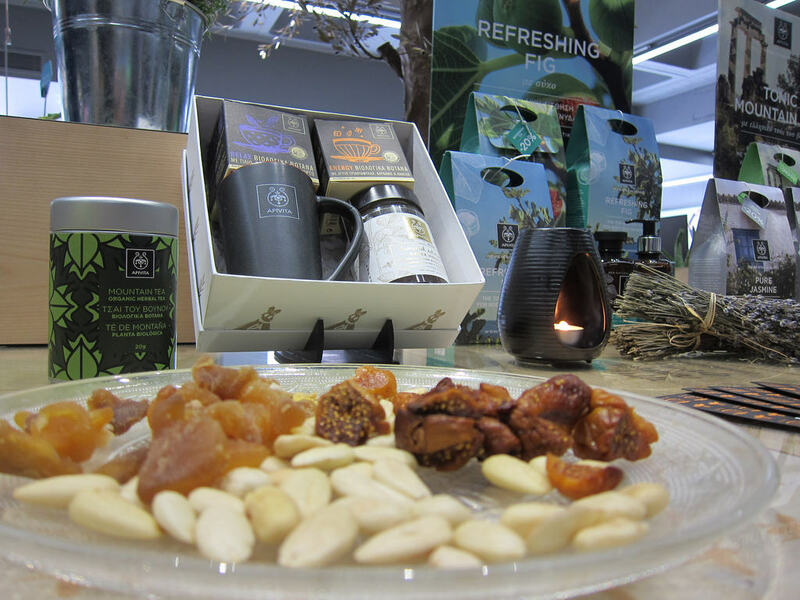 Having discussed Customer Experiences with Soul, our new approach to experience design on Saturday morning, Maria and I took the opportunity to visit the experience store with Eugenia in the afternoon, with Maria receiving a deeply relaxing massage in their spa. 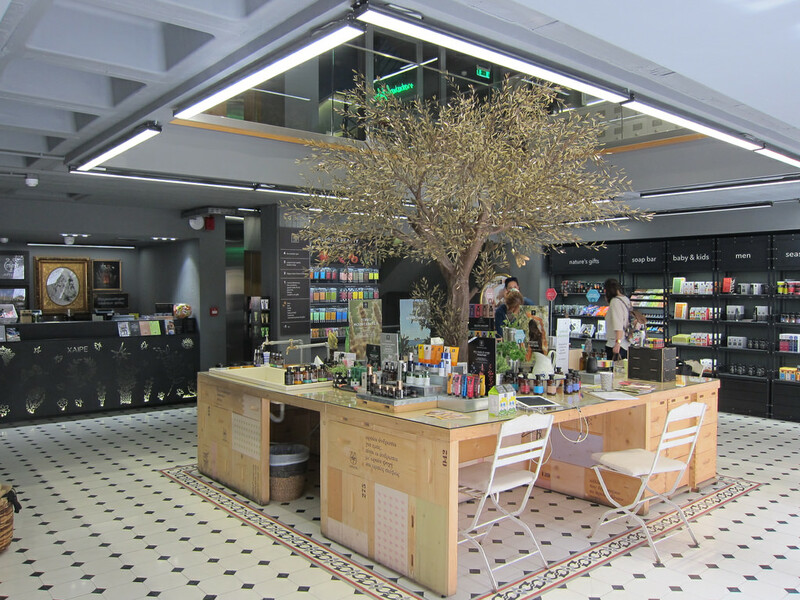 The store was chosen by Niki for its interesting layout, allowing those on the first floor to relax and look down on the central olive tree display which greets people as they enter. 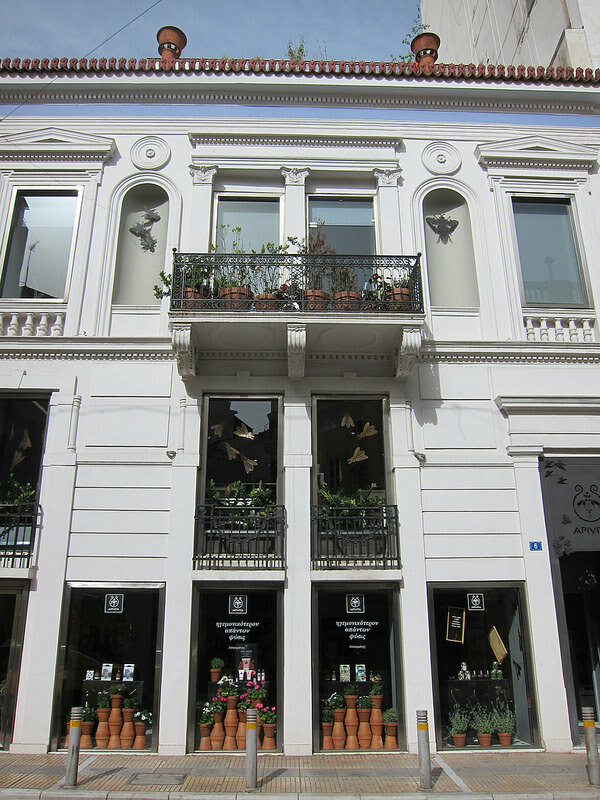 The store is located on Solonos Street in the heart of Athens, which had been the principal shopping street in the city. However, gradually many of the shops there had been forced into closure, and the area was in danger of never recovering. Contrary to all advice, Apivita opened the store in 2013 at the height of the economic crisis, with many wondering how the store could be a success. Contrary to others exptectations, not only did the store manage to attract both Greek and foreign visitors, there was also another impact. The store inspire five other major concept stores to open in the same street, thereby regenerating the area and encouraging commerce to flourish again. The store has five floors, with the ground floor being the main retail space, with the centre consisting of a beautiful table display made from wood from beehives. Customers can have personal consultations before any treatments or purchases. 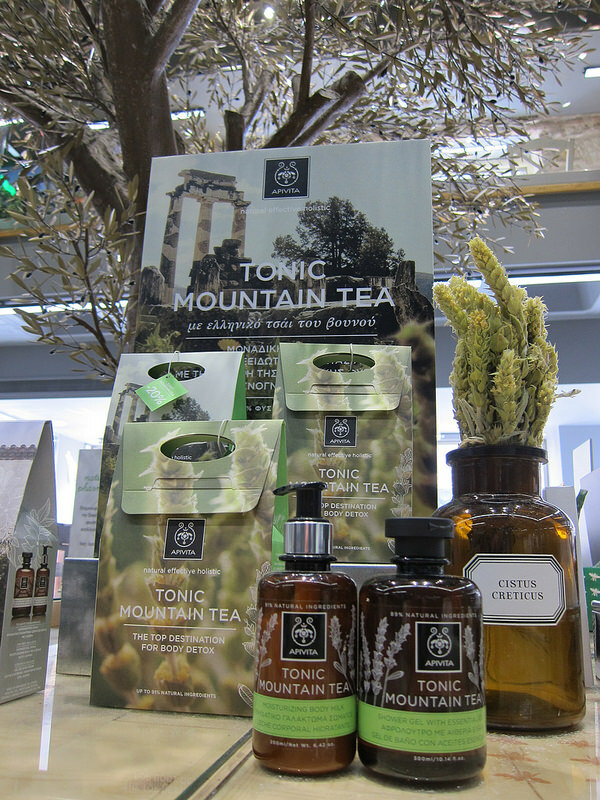 Apivita not only sell cosmetics and personal care products, they also produce teas and honey, and their mountain tea was absolutely delicious. 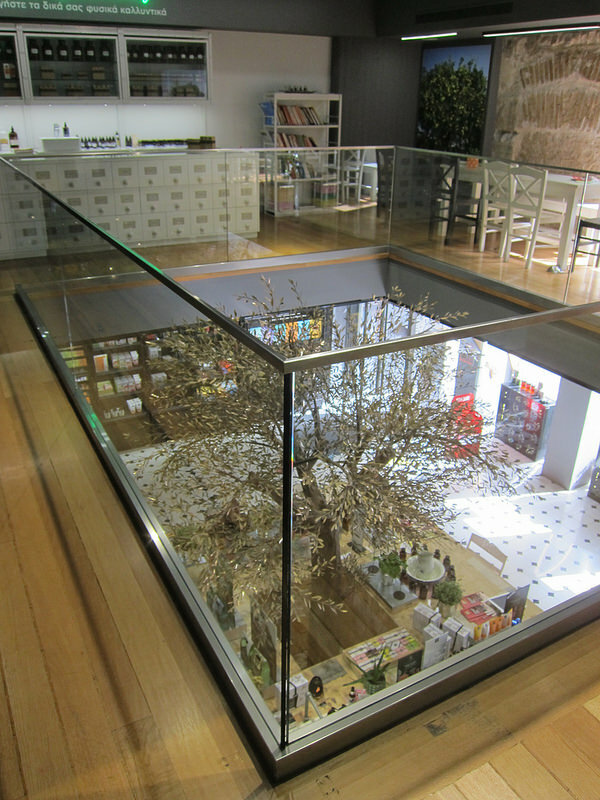 The store itself has five floors, and even has a secret hidden garden with a view across the city which you can not see from the street. Moving up to the first floor we find the natural pharmacy where products can be made for a single individual’s unique requirements, a juice bar which was the first of its kind in Athens, the herbs and teas displays, and also a number of tables where you can simply relax and chat. On the second floor there is the Hippocrates Lecture Hall, an wonderfully bright and open space designed to evoke the feel of an art gallery, where many events and educational lectures take place on a weekly basis. 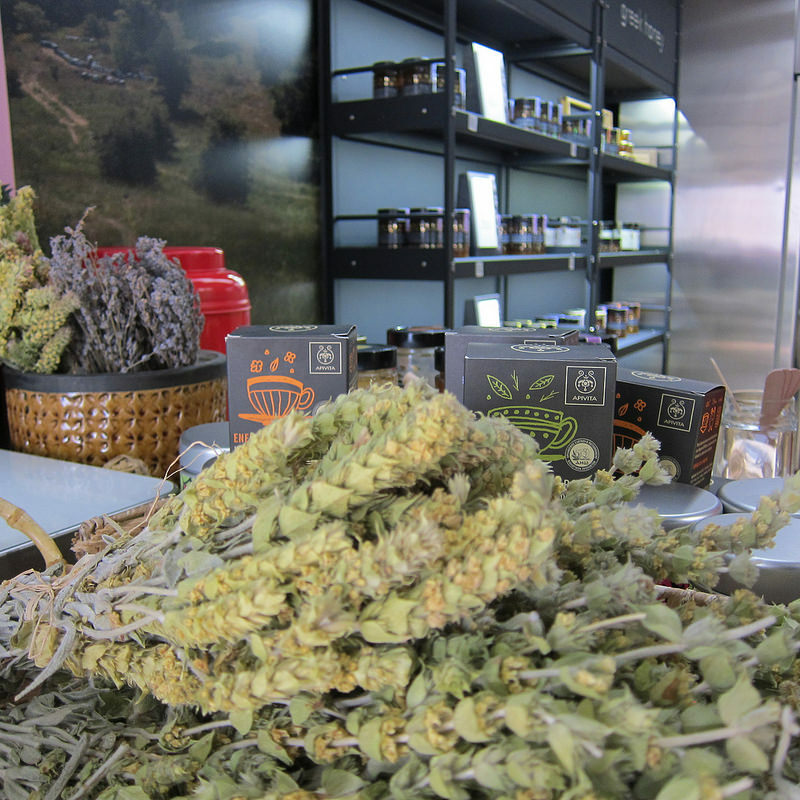 As Apivita say, they wish to “pollinate everyone with the knowledge of Greek plants and herbs, bee products and the honeybee society”. On the next floor there is a natural hair studio and barber shop, which allows customers to have treatments all using natural hair products, including natural hair colours. 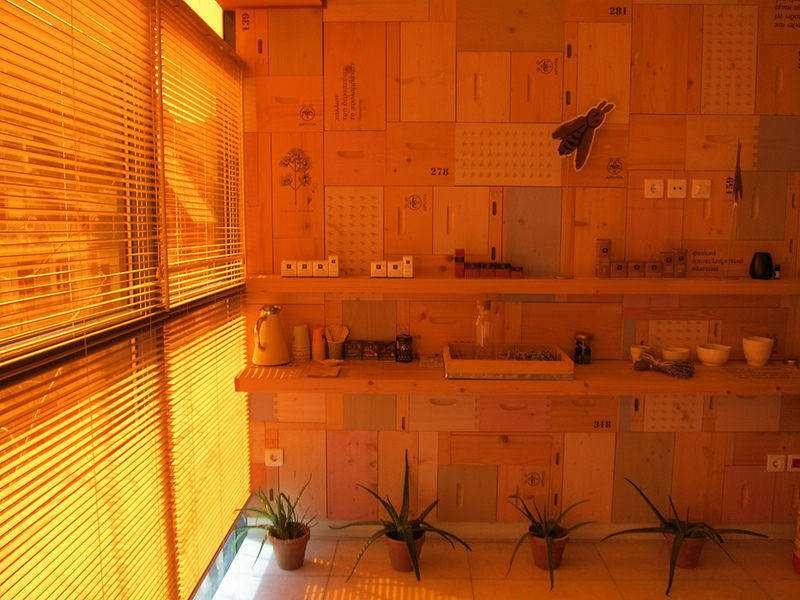 Above the salon is the spa, and what strikes you immediately is the sensation of walking into a room full of honey, an effect intentionally created with the yellow filters across the windows. 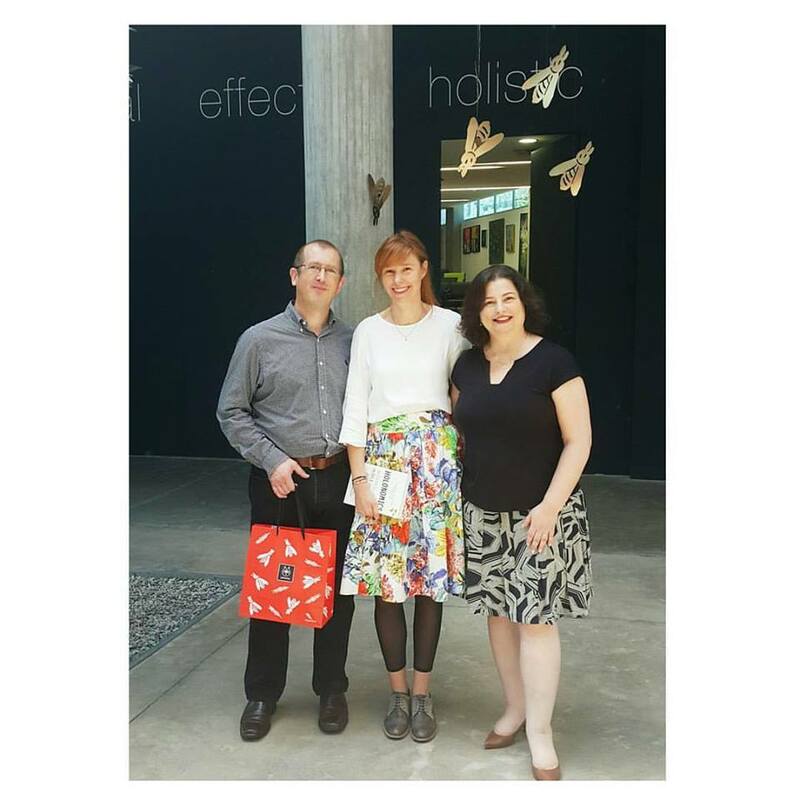 Maria really enjoyed our visits to both the experience store and also to the headquarters where we had the opportunity to talk a little about Holonomics, Customer Experiences with Soul in their lecture theatre with many of the team. We also carried on our conversations with some who also were able to attend our two workshops, where we talked not only about Apivita’s story, but also how they can now develop and grow, given the every-increasing interest in natural cosmetics, along with the developing trend towards more conscious consumption and the development of brands which are genuinely authentic and which connect people through their higher purposes. At EcoLogic we presented a number of different pieces of research which show the increasing importance for businesses in focusing on the customer experience. It is quite amazing that around 70% of new products and services fail to deliver on expectations, and at the event one of the key insights we emphasised was that this is a finding which relates not only to traditional business, but also to any sustainable product and service and also to an ecological or socially-responsible initiative. Sometimes it does feel that many in the sustainability sector shy away from phrases such as ‘customer experience’ but any initiative will fail to engage people if this aspect is not fully designed and developed. We had some really interesting conversations at EcoLogic around our widened definition of exactly who is a customer, and this relates to our definition of sustainability which is “the quality of our relationships”. In Apivita we find an excellent example of a holistic company which has managed to successfully integrate sustainable and socially responsible products, with a customer experience that is focused on the genuine desire to improve the well-being of people through a more enlightened understanding and sense of what beauty really is. The business locates itself within the wider contexts of both the economy and the natural ecosystems, especially the local biodiversity in Greece, and people are really responding to this way of being. Maria and I wish Apivita all the very best as they continue their story and continue to both grow, inspire, and help reframe our approach to both the design of businesses and the design of customer experiences with soul.